I have recently started to watch your videos via youtube and I have been enjoying them ever since. I really think that the work and effort that you put in your blog and videos help out a lot of people, It certainly helps out me! I work on a campsite in the Belgian Ardennes which focus lays on the outdoors. I teach the children multiple outdoor and bushcraft skills, as well as guiding them whilst doing different outdoor activities. The information your giving really helps out to stay creative and responsible in the things I share. Please excuse my language, for it’s not my native one. Keep up with the good work, I hope more info and videos will come out soon. Thanks for episode number 10. 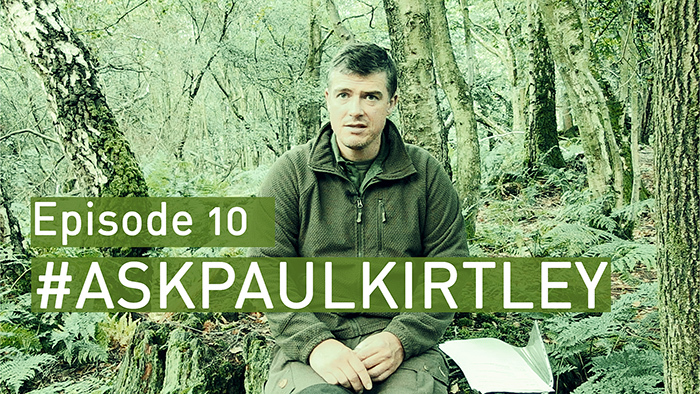 I have found all your ‘Ask Paul Kirtley’ videos to be very informative. As someone considering the journey to becoming an instructor, I find your observations on qualifications most insightful. I think that you offered some advice in episode 7 to aspirant instructors. Your remarks are helpful in understanding what a new instructor needs to offer a potential employer, in order to set them apart from other candidates and to offer added value to a Bushcraft School.. Thanks for episode #10! Liked the point about the time to set up at the end of a day!! I started watching a couple months ago gearing up for a few weeks camping in the smoky mountains. I was in need of a new bushcraft knife and interested in neck carry which you described in a few of your videos. I also purchased a head0ver (called buffs here) to help with the cold evenings in the mountains. Congratulations on the Q&A platform. Superb and it is ‘dovetailing’ so very well with your other media platforms. Very easy to access and absorb. Thank you. The final point on nationally recognised qualifications is very ‘interesting’. It will probably be discussed with no implementation for many years. In wider society there are so many folks out there running businesses or providing services who are quite simply ‘clueless’ as regards customer service , customer expectation , safety , ethical values, skill and general business sense. I am sure ‘Bushcraft’ is just another micro industry effected by the same blight. Most importantly there are a group of dedicated professional people like yourself who are committed to raising standards. This will organically expose those who profess to be experts and offer nothing more than sitting on logs around a fire. Some of us fall between the two camps and are fully aware of our limitations. But we understand that , ‘trade’ safely and try to exceed customer expectations. As I say the discussion will no doubt carry on throughout every quarter of the commercial sector of ‘Bushcraft’. Perhaps we need ‘Bush Advisor’ !! Once again thank you for all of your time and efforts. I would like to listen to these podcasts on my Podcast app on the iPhone. 1. Who takes an hour to set up a hammock?!? One of my favourite episodes yet! Brilliant. I am amazed at just how much time you are putting into your podcasts and website. Thanks very much for sharing this information. I appreciate just how much time goes into what you and that you do it for free. Please keep it up and it’s my intention to get some custom your way in the near future. You have introduced my to soundcloud and I mostly get my info from your blog and I’m in Ireland. I agree that some sort of regulation or qualification of Bushcraft instruction is badly needed, any person that wants to take it upon themselves to teach others bushcraft skills should have the relevant experience and knowledge, also they should be competent to teach those skills and have a means to prove that competency. My only concern is that through standardising and nationalising bushcraft, it becomes wrapped in red tape and beurocracy. For me Bushcraft is as much who I am as what I know and when confronted with sneering and ridicule I aim to give the uninitiated a glimps of the true meaning of the beautiful subject that is Bushcraft. Paul, many thanks for all your hard work, you are a fantastic ambassador for bushcraft and long may you continue. Ps Paul that’s one hell of a can you got there. Totally agree – a minimal standard can only do the bushcraft scene good, Incidentally I havre just bought a copy of Wild Food by Roger Philips rrp 20 pounds for 7 pounds at the works! I am a lurker here, so on your suggestion I am leaving a comment. Keep up the good work. When are you gonna answer Twitter questions again ? Well done Paul love the blog, not lurking just listening. Admiring your insane workload. A question for your “ask paul Kirtley” I’m always out and about in the New forest and see a and hear things that I would like to know more about. Where is the the best place to post this picture/ video to get more details ? Hi Jack. Your Instagram question is on the list will definitely be answered ina future episode. Hey Paul, always enjoy your videos, keep up the good work. from a Welshman living in Irvine, California. IF there is going to be a bushcraft standard certificate then I think there should be an ethical values component in it, e.g. never take a knife to a living tree, leave no trace, only take what you need, conservation, etc.. I completely agree that there should be ethical standards included. Quite enjoy watching & listening here in Texas, USA. Lots of good information you present, and in a professional manner. As an outdoor student of life for over 45 years now, it’s nice to learn something new on each episode – a good teacher is always learning, and I try to learn something new, even after 45 years, every day. Great job, and please keep up the good work. I look forward to each new episode. I appreciate your positive words about this series/format. I’m of the same view – that I’m always a student and there is always more to learn. It’s nice to be reaching like-minded people around the globe and, I hope, to learn from them too. I’ll check out your website. Forgot to mention that I’m not seeing the references mentioned in some of your episodes in any show notes. Am I looking in the wrong place? Haha, you’ve picked about the only episode that does not have any links in the show notes! 🙂 Select any of the other episode and you’ll see a heading “Links For This Episode…” with hyperlinks underneath to all the articles, resources, etc., mentioned in that episode. I just thought I would drop by to say ‘Hi’ and congratulate you on you ‘ASK’ series. Always of interest. For anyone who doesn’t know Paul, this information is very well rooted in extensive experience and is always spot on, in my view. Regards to the team, and see you soon, hopefully with the Irish contingent and DSD! Hi Gordon, good to hear from you and no bother about the rant. There is a general lack of understanding of bushcraft among mainstream outdoor leaders. As you say, bushcraft is somehow reduced in many minds to cotton wool and Vaseline, marshmallows and maybe building some ineffectual shelters. Some sneer about spoon carving. It’s funny though, when I did my ML assessment, a fair few years ago, they were bowled over by my environmental knowledge. Yes, exactly, I explained. Knowledge of nature is at the core of bushcraft. Indeed, many ML’s and paddlesport leaders would do well to improve their knowledge of the nature around them. With some it is at a pitifully low level, consisting of a few plants and birds learned in order to pass an assessment. Anyway, that’s my rant over 😉 Warm regards, Paul.